Above: Edward Kemp (1868–1964) excelled in lantern-slide images of the Southwest and shot many locales for both motion pictures and the Fred Harvey Company. Today only a part of the great house still stands, because an old Indian legend came true. ... A giant slab of cliff against which the place was built began to lean. Centuries of changing weather cut deeper and deeper while generations of Indians fearfully watched this Threatening Rock. Medicine Men believed that when the rock fell, the world would be embroiled in a terrible war. 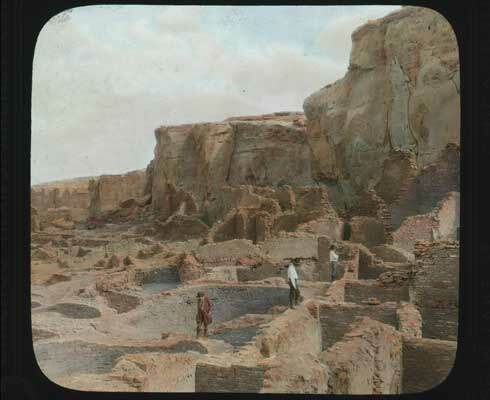 Well, the huge slab did crash down on the village Jan. 22, 1941, the year of World War II, many centuries after the Pueblo and Chaco Canyon were abandoned.